From MSG to Union Pool. 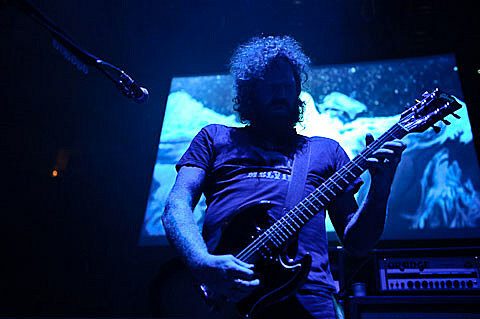 Brent Hinds of Mastodon (who just played MSG with Alice in Chains and Deftones) currently has at least two side projects, both of which are out on tour together. That tour hits Brooklyn’s Union Pool on 10/26. Tickets are on sale for the BV/1000 Knives production. You might not recognize him at times though. The six-stringer wears a stocking over his face (seriously) in his surf-a-billy side project Fiend Without a Face. 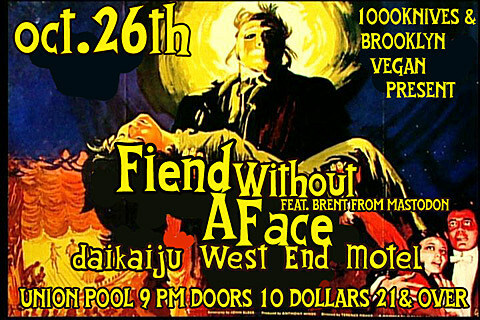 The other bands on the bill are his distinctly country-inflected band West End Motel, and their touring partners in the wild-Japanese-influenced-surf band Daikaiju. All dates and a few videos below.